Although the Chicago River is cleaner than ever before, a number of significant water quality threats still remain. 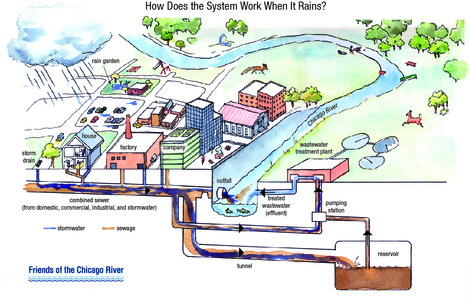 Chicago and our older suburbs have combined sewer systems that convey rainwater and sewage in the same pipes. Heavy rain events can overwhelm this system, flushing a mix of stormwater and sewage directly into the Chicago River, and—in extreme cases—back into Lake Michigan. All of this effluent is managed by the Metropolitan Water Reclamation District of Greater Chicago (MWRD). On a dry day, MWRD has the capacity to treat 1.4 billion gallons of wastewater across its three main Chicagoland water reclamation plants—Calumet, O’Brien and Stickney. Water enters the plants where it is strained, separated, centrifuged and, at the Calumet and O’Brien facilities, disinfected. Click here to learn more about MWRD’s water treatment process. Heavy rains complicate the water treatment process. Research by the City of Chicago shows that as little as .3 inches of rain, depending on location and severity, can trigger a sewer overflow at any number of the more than 300 outfalls that flow directly into the Chicago and Little Calumet Rivers. Of course, stormwater is clean before it hits the pavement, but pollutants like oil and garbage contaminate the rainwater. Then this polluted rainwater combines with domestic, commercial, and industrial wastewater into the combined sewer pipes, which frequently become overwhelmed. So you see, an increase in domestice sewer volume contributes to triggering a combined sewer overflow and sewage ends up in the river. To address sewer overflows, MWRD has built nearly 10 billion gallons of stormwater capacity across its Tunnel and Reservoir System Plan (TARP). TARP functions simply by holding stormwater in reservoirs until MWRD has capacity to treat it, effectively preventing the release of raw sewage into the Chicago River. MWRD estimates that TARP has eliminated at least half of all possible sewer overflows since 1980, and the system will expand to 18 billion gallons by 2029. What can you do to keep our river clean? CLICK HERE to learn how you can help stop overflows from polluting our river by taking action and reducing your water use during heavy rain falls. Download the "Simple Guide to Water Conservation"? Watch WTTW Chicago Tonight's "Tips for Conserving Water to Prevent Flooding in Chicago"
Know when an overflow is happening! Sign up for our Overflow Action Day Alerts, which will email you helpful reminders to conserve water and decrease the water going into the system and therefore (if we all try) decrease the frequency of combined sewer overflows. What is a Watershed Management Ordinance?